Andy Warhol (1928 –1987) is one of the most important artists in the twentieth century and remains one of the most influential figures in contemporary art and culture. Irony, according to Merriam-Webster, refers to the incongruity between the actual result of a sequence of events and the normal or expected result. Irony can be widely observed in Warhol’s art. This case study analyzes how Andy Warhol created irony in his art as well as his pubic persona and how it influenced the development of art. He created irony by breaking rules, incorporating culture, and creating ambiguity which can be applied to not only the art world but to fundamental architectural principles. Andy Warhol started his career as an advertisement illustrator in the 1950s and soon moved into the fine art world. Pop art emerged in the late 1950s in the United States as a reaction to Abstract Expressionism. Pop artists, including Warhol, viewed the work created by abstract expressionists as alienating to the public as it seemed to only be understood by the high art community. Conversely, Pop art is based on imagery of popular culture and consumerism, lending itself to a wider audience. Applying the concept of advertising to his artform, Warhol utilized the images of consumer products, celebrities, news stories and the process of repetition to highlight the concept of “mass production”, quite the opposite from the convention of high art where pieces are considered one of the kind. He blurred the line between high art and commerce both from the execution and the subject matter perspectives. He replicated American commercial products on canvas, such as Campbell soup cans and Coca-cola bottles. The repeated images, as if they are mass-produced even though he painstakingly painted some of them, completely disregard the well-honored artist’s hand but celebrate the artist’s mind leading to one of Warhol’s mantras: “It is the idea that matters, not the production of it”. The repeated images represent the effect of advertising on people as the more we see them, the more we become desensitized to them. Warhol’s work feels removed yet gripping. The artist often was ambiguous about the existence of meaning behind his work, leaving it to the viewer’s interpretation. One of the strategies that Andy Warhol employed to create irony was breaking rules. He broke the rule of well-honored convention of painting and sculpture to which the artist’s hand is the essence of the art. Warhol’s work separates execution from concept, attesting that it is the artist’s mind that matters. “Making the touch of the artist irrelevant to the authenticity of the painting is one significant element in the conceptual revolutions that made the art of the twentieth century so different from the art of all earlier centuries” (Galenson, 2009, p.198). One of the most recognizable works of irony from Andy Warhol is Campbell’s Soup Cans. It consists of thirty-two canvases each portraying a unique flavor of Campbell’s Soup, representing the thirty-two varieties offered by the company at the time. This set of canvases was done before he started using silk-screening. He traced the image from a photograph, using a projector to make a larger image. Then he painted each canvas to create an effect of mechanical production, void of an artist’s touch. His intent of removing the human touch from the painting and making them look like prints breaks the rule of traditional painting and sculpture. Moreover, the fact that he had to painstakingly paint the canvas to make them look ‘mass produced’, something much less worthy, is ironic itself. “On a number of occasions Warhol declared he played no part in the execution of his works...” (Galenson, 2009, p.197). Warhol subsequently produced a number of paintings depicting Campbell’s soup cans, including damaged cans. His choice of damaged cans as the subject adds another level of irony. These are the cans that we would usually consider bad and steer away from, however, they seem to represent individuality as opposed to conformism in art and hence have a higher value in art, at least to Warhol. Warhol not only elevates an everyday object to high art, he evaluates an object that we typically do not even consider worthwhile. Taking everyday objects and making them the spotlight of high art, Warhol successfully made his art relevant to the mass public. Unlike Abstract Expressionism, the preceding art movement in which art seemed to be reserved for the elites in the art community, Warhol successfully invited the masses to read and interpret his work. “The Soup Cans, at first widely dismissed as the ultimate cynical gimmick, were soon recognized as the first shots of a total revolution in American culture.” (Indiana, 2010, XIV) Campbell’s Soup Cans reproduces a mass-consumption object in the most literal way. “The deadpan presentation of a supermarket product in an art gallery had the additional twist of blurring the line between art and commerce.” (Scherman, Dalton, 2009, p.78) Warhol never explained his intent behind his work but allowed viewers to form their own opinions. Irony is inherently elitist. It has hidden meaning that is meant to be understood by those in “in the know”. It is ironic to think while Warhol’s work widens the audience of high art, it conveys the exclusiveness on the other hand. Warhol’s first show 32 Campbell’s Soup Cans in July 1962, at the Ferus Gallery in Los Angeles, created much controversy and invited a series of critical commentary, including the gallery next door at the time offering actual soup cans, 3 for 60 cents. (Fallon, 2011, p.28) Their attempt to comment on the commercialism of Warhol’s art ironically helped create the artist’s publicity. They completely missed the point and contributed to the irony. Similar irony can be found in other Warhol works in which mass-consumption objects are used, such as Brillo boxes and Coca-Cola bottles. Artist, Allan Kaprow, said in 1989 “In offering for sale endlessly reproducible images of Campbell’s Soup Cans or Brillo boxes, [Warhol] underlined art’s mercantile role and implicitly undermined the traditional artists’ romance of spiritual purity” (Scherman, Dalton, 2009 p.78). The subjects in his paintings also represent equality. Warhol once said about Coca-Cola, a subject for his 1962 Green Coca-Cola Bottles. The statement itself reveals the irony of consumerism which generally conveys the idea that the more money you have, the better goods you can buy. But in the case of a Coke, no amount of money can get you a better Coke than the one the bum on the corner is drinking. The rich probably felt a slap on their face. The repetition of the bottles not only reflects the dominance of Coca-Cola in the American society at the time, but also helps to convey the message that the richest and the poorest share the identical product. The silkscreen technique allows him to print the same image over and over, a potential for mass production. While the image can be printed endlessly, no one image is the same due to the nature of silk screening. The smudges and smears often found in his art add the humanistic quality, which again relates to the public. Andy Warhol is irony. He was a skilled social networker and a publicity master. He was fascinated by the power of media and skillfully built the mystique of his personality. His success was enhanced by his relentless ambiguity, deliberate mystification, and complete separation from his own work. Harold Rosenberg, an art critic for The New Yorker, declared that, “The innovation of Andy Warhol consists not in his paintings but in his version of the comedy of the artist as a public figure” (Gelenson, 2009, p.168). Victor Bockris, author of Warhol: The Biography wrote “The artist whose most famous work of art was himself” (Bockris, 2009, p.542). While Warhol was probably the most public artist, he revealed very little about himself and his inspiration. As he told one interviewer, “I’d prefer to remain a mystery, I never like to give my background and, anyway, I make it all up different every time I’m asked…” (Galenson, 2009, p.161). The curator Henry Geldzahler has commented on Warhol’s success in creating his own image and asserted that Warhol’s close friends of twenty or more years have the same questions about Warhol’s intent and control over meanings in his work as does the informed public (Galenson, 2009, p.161). In fact, Warhol consistently denied any meanings behind his work. His ambiguity and deadpan presentation of himself and his work has made him irresistible in attracting an audience and keeping his publicity. In Conceptual Revolution in Twentieth-Century Art, Galenson discusses the accusation of a conceptual innovator as a trickster. The fact he named his studio The Factory is also ironic. “Andy Warhol had not made art in a studio; he had turned it out with assembly-line regularity in a populous workshop he called The Factory” (Bockris, 2009, p.542). The ambiguity about his work and his persona open the possibilities for interpretation. Andy Warhol is one of my favorite artists. I enjoy the irony of the hidden meaning behind his deadpan presentation even though he consistently denied having embedded meanings. He explored the topic of desensitization by printing the repeated images of mass produced consumer products, commenting critically on the numbing effects of mass production. Through the use of irony, demonstrated by his choice of subject and the intentional inconsistencies of low quality printing, he not only blurred the definition of high art and mass consumption but also gave new perspective to everyday objects. Although his art may not suit everyone’s taste, he changed the way people see production and the kind of work people produced as his work offers a wide range of interpretation. On one hand, his work denounces the exclusivity of high art to the elite, reaching out to a much broader audience. On the other hand, the irony in his work seems to be understood by the selected audience despite the fact that he kept emphasizing the absence of meaning behind it. The same parallel can be made regarding the numbing effects of mass production in architecture. It is extremely easy for viewers of architecture to become desensitized to a structure once it has become a formulated space which ultimately makes it invisible as a work of art “...by comparison with the other arts, architecture is the most repressible: all other arts demand some minimal effort of reading…Even a painting demands a glance; whereas architecture can be lived in, be moved around in, and simultaneously ignored” (Leach, 1997, p.259). Inspired by Warhol, we can use irony to activate a particular space and create a dialog between that space and its occupants. Let’s take the Kalkin Residence I discussed in my earlier post as an example. 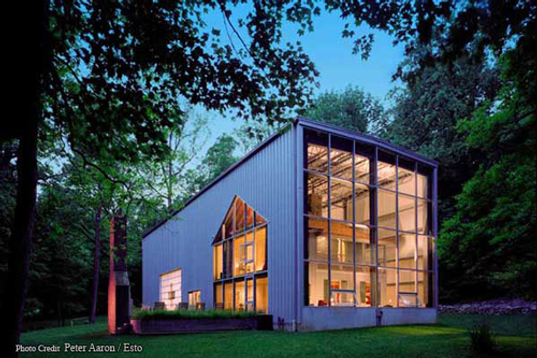 Architect Adam Kalkin created irony by breaking rules such as, building an industry shed around a 1880s country house. He also incorporated culture through cutting out the form of a gable on the façade with glazing. Furthermore, he created ambiguity by blurring the line between inside and outside as well as between functional and decorative. Irony challenges our preconceptions and expectations, to provide a voice to an otherwise “invisible” space, much like the properties of art. The incongruity between what is expected and what is in front of us makes us stop and think.&nbsp; Whether the reaction is positive or negative, that is irrelevant so much as it creates a dialog between people and the space they occupy. As long as we continue to create such dialog and exchange of thought, we will continue to create progressive and diverse architecture. Bockris, V. (2009). Warhol the biography. Cambridge, MA: Da Capo Press. Danto, A. C. (2009). Andy Warhol. New Haven: Yale University Press. Galenson, D. W. (2009). Conceptual revolutions in twentieth-century art. New York: Cambridge University Press. Indiana, G. (2010). Andy Warhol and the can that sold the world. New York: Basic Books. Jencks, C. (2002). The new paradigm in architecture: the language of post-modern architecture ([7th ed.). New Haven: Yale University Press. Perkins, R. L. (2001). The concept of irony. Macon, Ga.: Mercer University Press. Scherman, T., & Dalton, D. (2009). Pop: the genius of Andy Warhol. New York, NY: HarperCollins. Shanes, E. (2011). Andy Warhol. New York: Parkstone International. Why Does Irony In Architecture Matter? It is extremely easy for viewers of architecture to become desensitized to a structure once it has become a formulaic space, which ultimately makes it invisible as a work of art. A literary critic Fredric Jameson says “...by comparison with the other arts, architecture is the most repressible: all other arts demand some minimal effort of reading…Even a painting demands a glance; whereas architecture can be lived in, be moved around in, and simultaneously ignored” (Leach, 1997, p.259). The Russian Formalist, Viktor Shklovsky points out the risk of our habitual perceptions in Art as Technique (1917). As perception becomes habitual, it becomes automatic and no longer appears in our cognition. He offers breaking the habitual perception by defamiliarization. He argues that making things more complex and less coherent increases our consciousness and forces us to notice. The defamiliarization is a means to the recovery of the “sensation of life” (Samberger, 2004, p.132). Postmodernism saw the danger of the homogeneity of modern architecture and offered a series of ironic responses, which championed eclecticism. Irony challenges our preconceptions and expectations and increases our awareness of our surroundings, allowing architecture to act not only in a functional capacity but also as a medium of thought exchange. Leach, N. (1997). Rethinking architecture: a reader in cultural theory. New York: Routledge. Lemon, L. T., & Reis, M. J. (1965). 1. Russian formalist criticism: four essays (pp. 3-24). Lincoln: University of Nebraska Press. Samberger, S. (2004). Artistic outlaws: the modernist poetics of Edith Sitwell, Amy Lowell, Gertrude Stein and H.D.. Munster: Lit-Verlag. What is Irony in Architecture? To provide a common baseline of evaluation, the following are examples of irony in architecture. The Glass Farm in Schijndel, Netherlands, by MVRDV appears to be a brick farmhouse in the market square of a small Dutch town, however, it is actually a glass building with images of farmhouses printed on each surface of the façade. “This concept can be seen as a contemporary response to retro-architecture whilst respecting the public's wish for vernacular authenticity” (Frearson, 2013). Moreover, the images are printed in a larger scale representing the continued growth of the town. "When adults interact with the building, they can experience toddler size again, possibly adding an element of nostalgic remembrance to their reception of the building” (Frearson, 2013). To make the building more engaging, the actual windows and doors do not line up with the printed images. When people pass through the entrances, it looks like they pass through brick walls and windows appear as semi-transparent blobs. Another example is Kalkin Residence by architect Adam Kalkin. He bought an 1880s country house, built an industrial shed around it and cut out the form of a gable on one façade with glazing. The original house became the interior. Many of the functional elements of the original house have become decorative under the new perspective.&nbsp; For example, the roof no longer provides the shelter. Architect and writer Sam Jacob commented that this project explores the relationship between interior and exterior from an alternative angle. He pointed out the irony of Kalkin’s use of containers, “Kalkin sees the containers as narrative device, as well as simple and effective means of enclosure…You can look at them both as junk or as something special” (Long, 2008, p.32). Long, K. (2008). Hatch: the new architectural generation. London: Laurence King. I have been working on my Capstone Research Project this quarter. Here is an abstract of my research. This thesis explores how irony in architecture activates a space to create a dialog between the space and its occupants by breaking rules, incorporating culture, and creating ambiguity. With orthodox modernism, much of architecture has become formulaic and merely functional. Users of architecture become desensitized to a space once it has become formulaic. Irony refers to the incongruity between what is expected and what actually happens. This incongruity not only challenges our preconception and expectations but is also thought provoking, reestablishing a dialog between the space and its occupants that was lost among much of the orthodox modernist architecture. Through literature review and case studies of irony in various disciplines including art, architecture, product design, interior design, and branding, the findings reveal that irony engages users, provides them experiences that go beyond the everyday, and allows them to formulate their own story based on their repertoire of experiences.